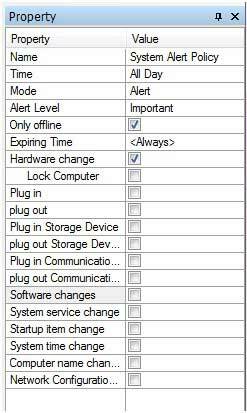 The system alert function is to give real-time alarm for computer hardware and software changes and key settings of the system changes to facilitate the administrator timely detection of changes of computers within the network. As constantly watching over monitored computers, administrators can get warning massages simultaneously, solve problems promptly, and thus modify the configuration parameter and increase the maintainability so that computers in the network can run in an optimum state. In SurveilStar Console, click menu Policies > Alert, click Add button to create an alert policy. Then you will see Property panel on the right as the picture below. In the following example, you can see that system would alert when hardware changes. Name: Give your alert policy a name like System Alert Policy. Time: Set effective time for your alert policy. Mode: Select policy execution mode. Alert and Not Alert modes are available. Expiring Time: Set expiring time for this alert policy. Or leave it to Always to make it always effective. Hardware change: Set alert or not when any of hardware assets changes, which will facilitate the administrator to maintain computer hardware assets and estimate, debar and repair the failure of computer hardware problem within the network. - - Lock Computer: Check this option to lock computer when hardware changes. Plug in: Alert when plug in computer peripherals, and will record name of the device. Plug out: Alert when plug out computer peripherals, corresponding to plug in. Plug in Storage Device: Alert when plug in storage devices, and will record name of the device. Remind the administrator to prevent the illegal use of external storage devices. Plug out Storage Device: Alert when plug out storage devices, corresponding to the storage device plug in. Plug in Communication Device: Alert when plug in communication device, and will record name of the device. Remind the administrator to prevent the illegal use of external communication devices. Plug out Communication Device: Alert when plug out communication device, corresponding to the communication device plug in. Software change: Alert when any of software assets changes, which will facilitate the administrator to maintain computer software assets and estimate, debar and repair the failure of computer software problem within the network. System service change: Alert when system service of client machine changes, to help administrator to solve problems caused by virus or system. Startup item change: Alert when startup item of client machine changes. System time change: Alert when system time of client machine changes. Computer name change: Alert when computer name of client machine changes. Remind the administrator to prevent the illegal operation on client machine. Please note that: Not only the alarm type but also the specific description will show, to help administrators quickly locate the problem occurred and solve the problem.